These ladder yarns are marked 'SECONDS' due to slight imperfections that did not meet our quality standards. These may include dye lots that may not be quite right; a glitch, slubs or knots; irregular winding or mis-shapen balls. 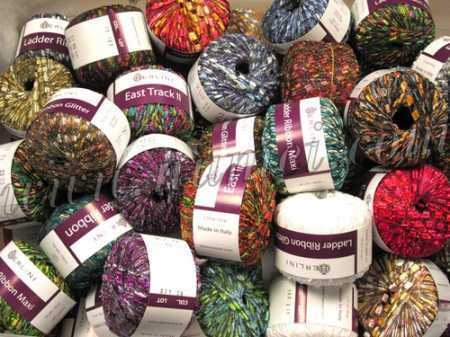 The ladder yarns in this lot may include Ladder Ribbon, Ladder Ribbon Glitter, Ladder Ribbon Maxi, East Track II and/or West Track. These are all full, unused balls with marked labels. We regret we are not able to accommodate yarn choices or color selections. Yarns sent will be random. These yarns are sold 'AS IS'. ALL SALES ARE FINAL. NO RETURNS WILL BE ACCEPTED.